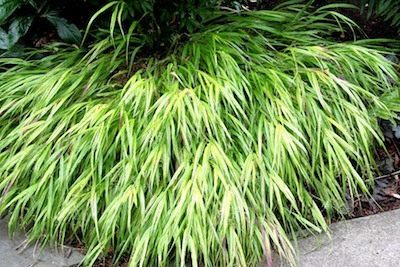 Have you tried growing Hakonechloa macra, called Hakone grass or Japanese forest grass? It is grown for its mounds of lovely arching foliage that only grow about a foot tall, becoming fuller and more graceful with time. The cultivar ‘Aureola’ has satiny, shimmering wide foliage striped in cream, chartreuse, and green. I have seen beautiful clumps of this grass arching over northern and northwestern garden beds. Several local South Carolina master gardeners have tried, without success, to grow this exquisite grass. I have killed it several times myself. USDA rates it for zones 4-9 and on the Cathey heat zone index, 9-4. It would seem that we should have no problem growing this plant, so what are we doing wrong? The cultural requirements call for moist shade. This is true to an extent. I have killed it with water and without. I have tried leaving it in its little 4-inch pot to grow larger. It died. I tried growing it in the amended clay. It lasted longer and then succumbed. To find out if the grass had been tested in the heat and humidity of the south, I contacted the National Gardening Institute. It appears we should grow it like the herb rosemary. The roots are at the root of the problem. It needs perfect drainage. The roots need to stay moist but they will not tolerate wet, mucky clay, what passes for soil in my garden. The roots rot. If its roots dry out, it dies-just like rosemary, and, like rosemary, no amount of water brings it back. It needs moisture, day in and day out, but it will not tolerate wet roots. In Armitage’s Garden Perennials, Allan Armitage says of this grass, “I like all the cultivars... I only wish they were a little quicker to grow and more tolerant of the abuse heaped upon them in the Armitage garden.” He recommends part shade, heavily enriched soil, and reliable moisture. If you have a shorter summer season in your Northern garden, you should have no trouble growing this fabulous grass. If you live in the South and are ready for a challenge, try this grass. I confess that I love it. I am going to give it (and me) one more chance. Armed with new instructions, next year will I have shimmering ribbons in the shade? A gardener can dream.